Socially, New Jersey is considered one of the most liberal states in the nation. The United States Equestrian Team is headquartered in Gladstone, NJ. 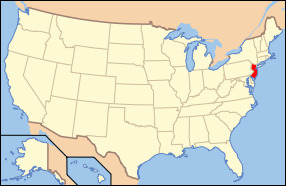 The state of New Jersey in located in the Northeastern and Middle Atlantic areas of the U.S. And is bordered to its north and east by New York, on its south and southeast by the Atlantic Ocean, on its west be the state of Pennsylvania, and on its southwest side by Delaware. The state is the 4th ranked least extensive state in the country covering just 8,721 square miles and is the 11th ranked most populated state with a population of 8.82 million as of 2011. The capital of New Jersey is Trenton however the largest city in the state is Newark. The area where present day New Jersey sits was inhabited by the Native Americans for almost 3,000 years with tribes such as the Lenape who lived along the coast. It wasn't until the 17th century when the Swedes and the Dutch began the first European settlements to the area. Later the British gained control of the area and gave it the name “Province of New Jersey”. Later on in the history of the state in the 19th century, many cities with factories such as Paterson, Trenton, and Elizabeth drove the Industrial Revolution in the state. New Jersey is home to more than 9,800 farms covering 790,000 acres. The state is among the leaders in many forms of agricultural production. New Jersey ranks: 2nd in blueberry production, 3rd in cranberry production, 3rd in spinach, 4th in bell peppers, 4th in peach production and 4th in head lettuce. The state also produces an abundance of tomatoes, corn, apples, strawberries, potatoes, hay, soybeans and nursery stock. Officers from the New Jersey Society for the Prevention of Cruelty to Animals can monitor for infractions during traffic stops or seat-belt campaigns, and issue tickets with fines ranging from $250 up to $1,000 for each unrestrained animal in a vehicle. Under the 16-year-old law, letting a pet ride unrestrained amounts to animal cruelty if the driver gets into a crash.